And, all these advantages lead directly to costs savings. ACM’s patented technology uses sophisticated algorithms that optimize the machine’s programmed feed rate — speeding up cutting when the path is obstacle‑free and slowing down when geometry, material hardness, or tool conditions demand caution. ACM’s feed‑rate optimization reduces cycle time with the minimum of wear and tear on the machine tool and cutting tool, and achieves maximum quality for the machined part. 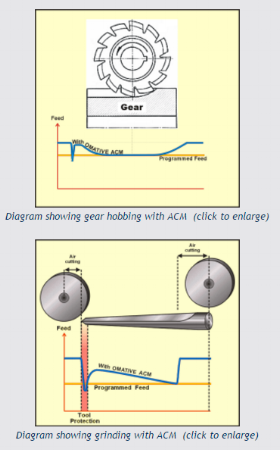 ACM monitors and protects tools, spindle, parts and the machine itself. The ACM issues alerts on tool status, allowing tools to be changed only when they are worn. This leads to extended tool life and significant savings on tool costs. The ACM system monitors both upper and lower boundaries so that it simultaneously tracks and detects conditions of tool overload, tool breakage, missing tools or parts, no‑load situations, and erroneously repeated runs of the same part. The system alerts operators to these dangerous conditions, allowing correction of the situation before damage occurs. In accordance with the strict specifications required for hole‑making operations in the aerospace industry, ACM “Advanced Monitoring” mode monitors spindle power, spindle speed and coolant flow, and records and reports the history of critical machining events. Advanced Monitoring mode conforms to GE‑P11TF12 specifications to monitor machining of critical aero‑engine parts and has been authorized by GE for monitoring use. Similar specs are required by Volvo Aerospace, Rolls Royce Engines, SNECMA and other aero‑engine manufacturers and these have been met by ACM Advanced Monitoring. Shopfloor managers benefit from the informative reports the ACM automatically produces containing the data and insight they need to improve overall machining operations. Reports on machine and tool utilization, actual feed rate, timesavings, tool wear, tool life, and more are available for each machine equipped with the ACM. OMATIVE solutions keep operations streamlined and sustainable. Metal cutting using the ACM is benefits the manufacturer and is the environmentally‑friendly solution. Virtually all new and old CNC machines can be equipped with ACM technology. Its two main components are the HMI and the real time control which automatically performs monitoring and optimization functions.